Sunderland midfielder Lee Cattermole has said he and team-mate Adam Johnson owe a lot to Tuesday's Capital One Cup opponents Middlesbrough. Cattermole, 24, and Johnson, 25, came from the Teessiders academy ranks to make their senior bows for Boro. "Adam and I were talking about how much respect we have for the club," Cattermole told BBC Newcastle. 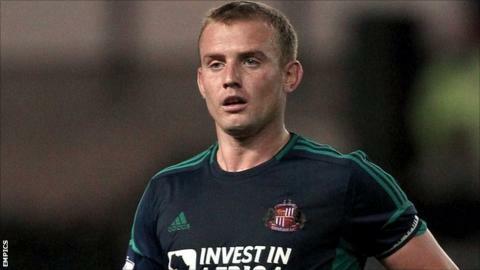 Stockton-born Cattermole made his return to the Sunderland first-team in Saturday's goalless draw at Stoke City. It was his first game back following a three-match suspension for a red card, the seventh of his career, in the last round of the Capital One Cup against MK Dons. "It's a tough part of the game and you can't always get them right," he said. "If you slightly mistime a tackle then you're going to spend time on the sidelines. "It's something I need to be careful with as with my high energy game I bring something to the team, and the manager needs me on the pitch." "It's where our education came from. We learnt an awful lot. They gave us our chance and they're a great club." He added: "I'll always hold Middlesbrough close to my heart. I'll always remember my time there." Cattermole, made his top-flight debut with Boro against Newcastle in January 2006. It was the first of 69 league appearances for the Riverside outfit before he was signed by then-Wigan boss Steve Bruce in July 2008. Johnson made his debut against Arsenal the previous September in a tally of 96 league games before a £7m switch to Manchester City in the January transfer window of 2010. The duo - if selected - will come up against a Boro side who have picked up four wins from their last four in the Championship, and scored seven goals. In contrast, Martin O'Neill's Black Cats have scored only six league goals all season, five from summer signing Steven Fletcher, and the other an own goal by Newcastle forward Demba Ba. "It comes down to a bit of a lack of confidence in the final third," Cattermole said. "Once we score a couple of goals, I think the confidence will flow. I don't think it'll be a problem."